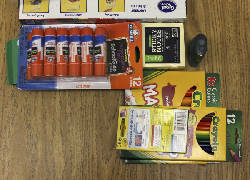 School supplies are seen in Tanya Roberts' kindergarten classroom at Harrison Elementary School on Wednesday, Aug. 9, in Harrison, Tenn. Here we are in 2017 with a smart, fresh new school superintendent to whom we have handed many of the same problems our schools grappled with 20 years ago — but with two decades of additional failures. Funding, segregation and equity problems today are the same funding, segregation and equity problems that faced the Hamilton County Department of Education in 1997 on the first day the county's newly consolidated school system opened classroom doors. That fall morning followed years of debate that culminated in a 1994 vote in the city over whether Chattanooga should get out of the school business and leave educating children to the county school system. City voters, split along racial lines with the black community strongly opposed, narrowly approved consolidating the school systems — 22,694 to 19,044. The vote forced the predominantly white county to take control of the predominantly black city schools. "Right from the start we had to talk about the black and white issues and integration of the schools," Jesse Register, the first superintendent of the merged system, recently told Times Free Press reporter Kendi Rainwater. And that's still where we are today — talking about equity in funding and supporting all schools — so much so that our system continues to struggle with chronic under-performance at a number of our high-poverty schools. The state is now weighing interventions for five of our district's 79 schools. At the same time, several municipalities, primarily Signal Mountain with three of the county's top-performing schools, are contemplating starting separate school districts because they are concerned the county does not adequately support the schools. And it doesn't. We don't. We continue treating every school equally and unequally in the worst ways possible. We — we the community that bosses we the county commission and we the Board of Education — refuse to address the fact that many students at Orchard Knob Elementary have not had the home and early childhood talking and reading advantages that the children starting school at Signal Mountain Elementary have had. We refuse to see that the art and music lessons Signal's private, nonprofit Mountain Education Fund provides enhance the classroom experiences those students have, while the struggling kids at our poorest schools have some of the county's newest, least experienced and least effective teachers working on the basics (forget art and music, which research shows to provide some of the most effective learning connections in any school toolbox). That's our failure, people. It's not Jesse Register's failure. His only failure was trying to make up for our community omissions. When he couldn't get county commissioners from the majority suburban communities to better support all schools consistently (Why should they? PTA's out there in suburbia were picking up the slack) he introduced magnet schools that would encourage voluntary desegregation. When he convinced the Benwood Foundation, the Public Education Foundation and then-Chattanooga Mayor Bob Corker to invest in the struggling inner-city schools, the extra attention at those schools elevated tension among the suburban leaders and residents. Despite the constant battles Register had to fight with the majority white board and county commission, the inner-city schools posted steady improvements and gained national attention. But when Register left in 2006, a lot of the foundation money dried up and work stalled. Frankly, our 20-year failure can't even be blamed on the next two superintendents. They tried. But with each, the effort was too little, too late to overcome the suburban, political backlash of this small-minded county that never quite got over Brown vs. the Board of Education. That's on us and no one else. Today, a third of Hamilton County's schools educate a large share of students living in poverty, and most of those schools are concentrated inside Chattanooga's city limits in some of the city's most impoverished and primarily majority minority neighborhoods. Poverty is not crippling to education. But the concentration and segregation of poverty are, if not aggressively addressed. Three percent of graduates at our predominantly poor schools are considered college and career ready, according to ACT results. Thirty percent of students attending schools without a large share of poor students meet college and career benchmarks. Districtwide, data shows 65 percent of graduates of the Hamilton County Schools system fail to earn any degree or certificate past high school within six years, which leaves them unqualified for the majority of jobs coming to the area. Forget racial and class boundaries. We are failing our children. Period. We are failing out community and ourselves. Our new superintendent, Bryan Johnson, is energetic, savvy and impressive. He can help us if — and this is a monumental "if" — we're willing to help ourselves and our children.